You will create a purchase order in order to receive purchases into inventory. There are two steps: entering the purchase order and receiving the items. You will receive the items into inventory when they arrive. You also can receive the items immediately upon creating the PO. The system can send an email to one designated person if you wish that person to approve the PO. See Inventory Setup for instructions. The system can create an accounts payable vendor invoice upon receipt of a purchase order. See Inventory Overview. This is not commonly done and is not recommended since the shipping document may not show the actual amount invoiced by the vendor. 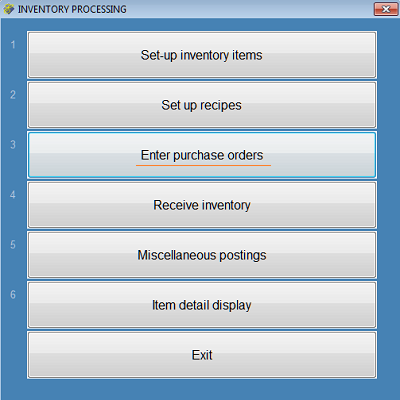 Go to Inventory Processing > Enter Purchase Orders. The ENTER PURCHASE ORDERS window will open. Enter the P.O. Number, up to ten characters. Enter the Vendor Code or press Enter to look up the vendor by name. Enter the P.O Date. If you are integrating with A/P, this also will be the invoice date. Enter the Due Date. If you are integrating with A/P, this should be the date the invoice is due. If you are not using A/P you may leave this field blank. If you are using A/P you must enter a valid date. Enter the General Ledger Date. If you are integrating with G/L, this typically is the date to expense the purchase. If you are not using G/L you may leave this field blank. If you are using G/L you must enter a valid date. Enter the Freight amount. You may leave this blank. Enter the Department code for this purchase. You may leave this field blank. The Authorization field will populate when the Authorize button is selected. See also Store, Locations, Classes-Categories for designating a user for PO authorization. The P.O Total will calculate automatically when you press Enter in the OK? column to save the line and will accumulate the totals. Your cursor will move to the ITEM column as shown below. Enter the Item code or type ? to look it up by description. To look up items by the vendor's item code, click "Look up items by the vendor's item code" at the top of the screen. The vendor item code is an optional field in the item setup. See Inventory Items. The item's description will display. Size and Color are optional fields. The purchase location will default. Enter the quantity to order. Note, as shown in the image above, that the purchase unit if measure displays at the bottom of the screen along with the stock quantity and ratio. Press Enter until you get to the Cost/OK field. Press Enter again to save the line. Below is a sample Purchase Order. When you have finished entering the items, click Save to save the PO. 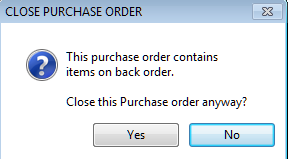 If someone has been designated to receive an "authorize purchase order" email, the following will display. The user will then bring up the PO and click the "Authorize" button. Don't forget to update the batch. 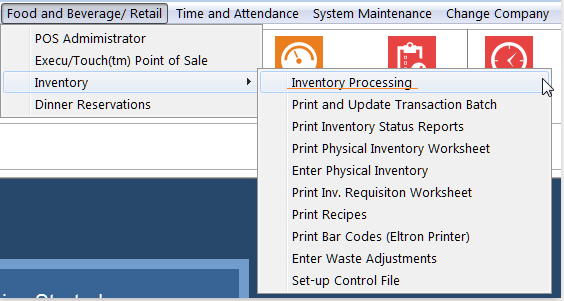 From the Inventory Processing menu, select Receive Inventory. When the screen opens, enter the PO number or type ? to look up the PO. The following will display. The PO will display, as shown. If receiving all items ordered, click "rec'v All". Otherwise, enter the number of each item received, as shown below. If the quantity received is not the quantity ordered, you can backorder the items if you wish. This means that the remaining quantity not received will stay as "QTY ORDERED" on this PO, allowing you to receive them at a later time. When you're finished, click "Receive". Click "Save". You can close the purchase order now or later. 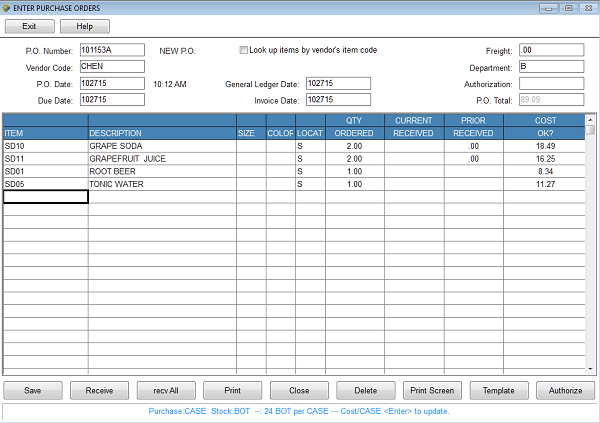 Below is the Item Detail Display for a purchase order and the receipt of the purchase order. You can create a templates for recurring purchase orders. This will save you time for items you order regularly. Reopen the purchase order. The old PO number will display. 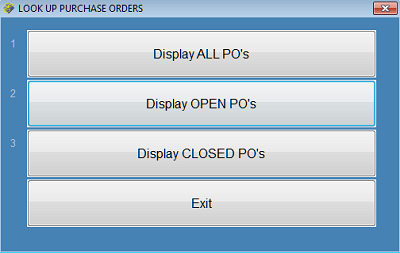 A prompt will allow you to enter the new purchase order number. Enter the new PO date. Save and update the PO as it appears, or make changes as appropriate and then save and update it.